On April 28, 2018, at approximately 8:00 PM, the unknown suspect seen picture below fired multiple shots at the complainants at 7150 Chaucer Place. No one was shot; however, he did expose others to that gunfire. 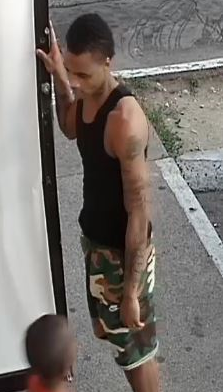 The suspect is described as a Black male, approximately 20 to 25 years old, 5’10” 150 pounds. He was seen wearing a black tank top and green/brown camo shorts. This incident is documented on case number 089631-2018. If you have any information or possibly come in contact with the suspect, please contact Crimes Against Persons Detective B. Billings #7626, (214) 671-3083. You can also use iWatch Dallas from your smart phone and leave an anonymous tip. Crime Stoppers pagará hasta $5000.00 dólares sobre la información que condusca a la detención y acusación de esta ofensa del crimen o cualquier otra ofensa de crimen. Si usted tiene información sobre este delito, llame Crime Stoppers al (214) 373-8477, 7 dias a la semana.